Shawn Langdon in the Alan Johnson Racing Top Fuel dragster. It looks like Shawn Langdon will get a chance to chase the championship after all. 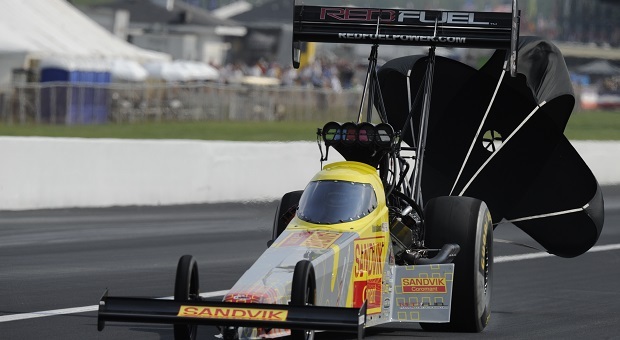 In an unexpected act of cross-team support, Don Schumacher racing announced today that Langdon will drive DSR’s Red Fuel Powered by Schumacher/Sandvik Coromant Top Fuel dragster in the 2015 NHRA Countdown to the Championship. Langdon had been driving for Alan Johnson racing, and despite AJR’s sponsorship challenges this season, Langdon had helped the team get to sixth in the point standings, qualifying for the Countdown to the Championship that kicks off this weekend in Charlotte at the zMax Dragway. However, after this week’s announcement that AJR will be withdrawing from the chase until additional sponsorship could be acquired, Langdon was left in the cold. But DSR and AJR stepped up to give the driver a chance, even if it means winning for a competitor. According to DSR, owner Don Schumacher said he reached an agreement with Alan Johnson to make Langdon an “on-loan” driver to DSR for the six-race Countdown to enable a full 10-car field to contend for the world championship and for the Red Fuel/Sandvik team and Langdon to have a chance to win the prestigious title. “Alan and I were able to work this out and it benefits everyone,” Schumacher said. 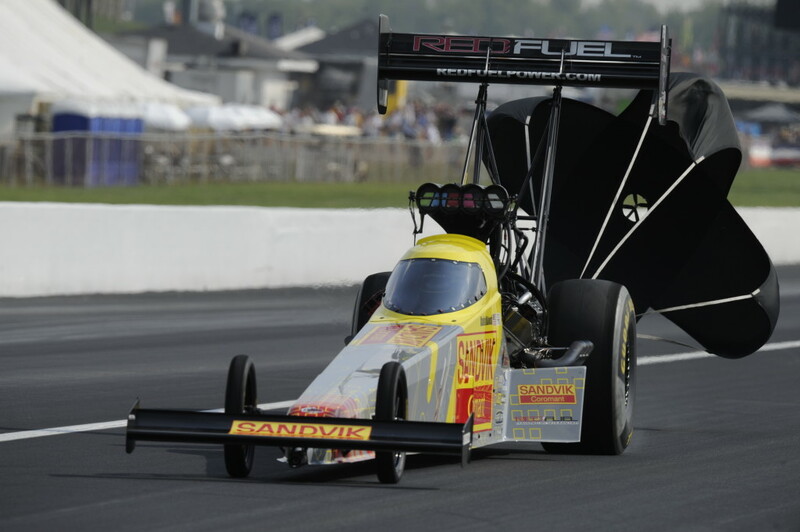 Khalid alBalooshi driving the DSR Red Fuel Powered by Schumacher/Sandvik Coromant Top Fuel dragster. DSR is no stranger to driver changes this season, particularly those with ties to Alan Johnson racing. Prior to the Chevrolet Performance NHRA U.S. Nationals, former Alan Johnson Racing driver Khalid alBalooshi drove the DSR Top Fuel dragster at Indianapolis, replacing Spencer Massey who had been the primary driver this season. However, even with alBalooshi behind the wheel, the team finished the regular season in 11th place and did not qualify for the Countdown. Although he remains under contract with Alan Johnson Racing, Langdon will compete as if he were the regular driver of the DSR dragster for the six-races that comprise the Countdown. When the 2015 season is complete, Langdon will resume his duties with Alan Johnson Racing. Terms of the agreement will not be disclosed. “To start the season with Alan Johnson Racing and finish it at Don Schumacher Racing is definitely a unique situation,” Langdon said. “Everyone at AJR gave it 110 percent all season to try to contend for the championship. Thanks to Toyota for stepping up for our team in a time of need and giving us that opportunity. We can’t thank them enough, and we can’t thank the AJR crew guys enough for sticking with us. It was just unfortunate that we couldn’t find enough funding; it’s disappointing not to be able to finish the season. I am sincerely beginning to wonder how much longer NHRA and NASCAR will be able to survive without some serious changes. Professional racing has been taken from the hands of regular guys who just want to race and put into the hands of the elite. It costs millions to compete in ANY professional series these days. There are no more “stock” cars that anyone could build in their garage to race on the weekends in the pro divisions. There are only “template” cars made of parts that are just too expensive for the normal “Joe” to purchase if he could even find them. The days of hanging out at the local speed shop are gone. I’m just afraid that the NHRA and NASCAR are pricing themselves right out of business. 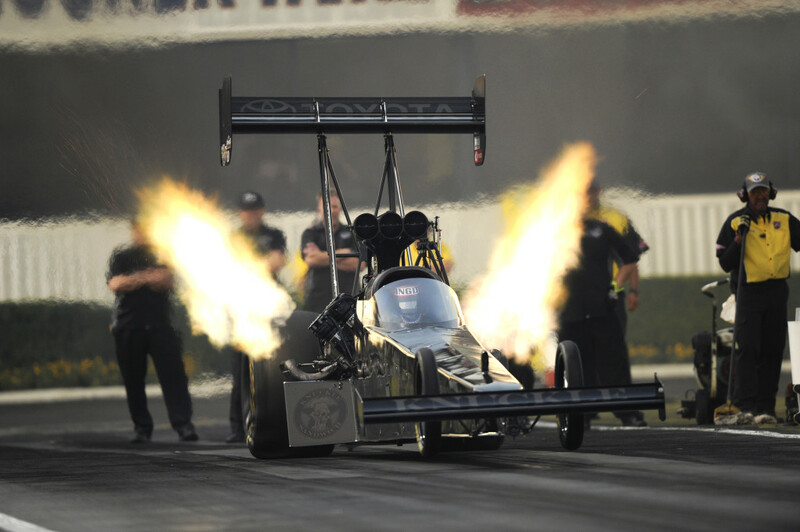 Without major changes NHRA’s future is dim. They are having a hard time filling fields now because of costs to participants. 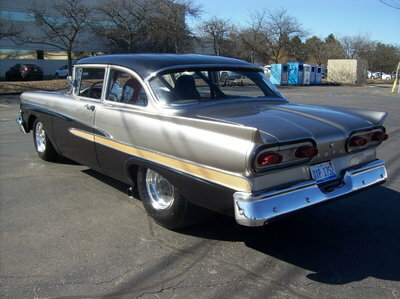 The new Pro Stock rules about no hood scoops and EFI may help a little, but??? It would be a shame to watch the most unbelievable thing you can imagine, a Top Fuel run, fade into history. People who have never seen them run at night have missed one of the most visceral things on Earth.